Each week this month I have been sharing about topics related to your baby's eating habits. 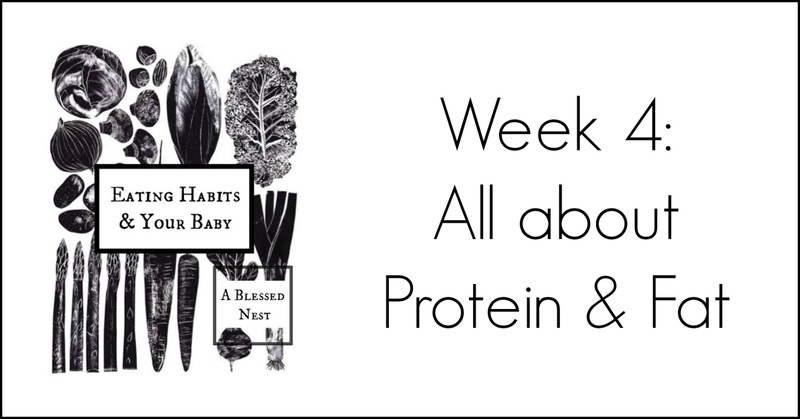 Today's post is the final week of this series and in it, I will be discussing the importance of protein and healthy fat in your baby's diet. I will answer some common questions associated with those food groups and also share a list of foods that contain protein and healthy fats which are easy to incorporate into your baby's diet. Both fat and protein are extremely vital parts of your baby's diet. A baby should be eating protein at every single meal, just like an adult. Many parents feed their child fruits and vegetables on a consistent basis but forget the most important parts: fats and protein. One third of a baby's daily calories should be made up of fat -- monounsaturated and polyunsaturated fat, or what most people refer to as "the healthy fat." One third of you baby's daily calories should also be made up of protein. Protein is needed by everyone -- for every cell in your body -- but it is especially important for babies and toddlers because protein supports growth and development -- something they are constantly doing! The amino acids that make up protein are the building blocks of a body's cells. Our bodies can only produce 13 of the 22 essential amino acids, so naturally 9 of them must come from food. Skimping on protein can slow growth, decrease immunity, weaken the heart and lungs and zap the energy that babies need to learn, play and explore. Every cell in the body contains protein and it makes up enzymes needed for chemical reactions. Protein is needed for proper bone and muscle growth, as well as hair, skin, and all other organs. The body also uses protein to produce hemoglobin that carries oxygen in the blood. Finally, at no other time in a child's life will he or she experience such rapid growth and development. Good nutrition in general -- and especially adequate protein -- is the key to ensuring that growth and development proceeds optimally. Why isn't breast milk enough? Often, a baby's body weight (from birth) doubles by age 6 months. Breast milk supplies all the protein a baby needs until 4-6 months, however when you introduce solid foods, you must also introduce protein. Because a baby's body cannot store protein the way it stores fat and carbohydrates, they need protein every day, at every meal. How much protein is required? Because protein is so essential for infants' tissue replacement and growth, more protein is required for infants (per body weight) than for older children and adults. During the first year of life, on average the DRI for protein ranges from 9-13 grams per day. Fat supplies your baby with energy for their liver, brain, and heart. It ensures proper growth and brain development, provides energy and promotes wound healing. It also helps your child absorb certain vitamins. Fat also supplies more calories than protein and carbohydrates and because of rapid growth, a baby needs those calories for energy. Getting all the calories they need without fat would be almost impossible, simply because their small stomachs can't hold that much food! How much fat is required? The current recommendation for infants under age 1 is to consume a minimum of 30 grams of fat per day. This amount is often provided in milk produced by a mom and consumed by a regularly breastfed infant. If your baby is no longer breastfeeding or it has decreased significantly, it is even more critical that they get fat from food. What types of fat are important? Essential fatty acids, or EFAs are types of fat that are essential in the diet because they cannot be produced by the body. These fats help build cells, regulate the nervous system, strengthen the cardiovascular system, build immunity, and help the body absorb nutrients. EFAs are also vital for healthy brain function and vision. DHA plays a critical role in neurological development and visual acuity. DHA can be integrated both into your baby's diet and into your own diet if you are breastfeeding. Examples of foods high in DHA (omega-3 fatty acid) include salmon, halibut, walnuts, and flaxseeds. Coconut Oil // I add this to almost every food Olivia eats! A great source of high quality fat and delicious too! Kale // Full of omega-3 fatty acid // We introduced kale to Olivia around 10 months of age and she loves it! Obviously, the type of fat your baby is getting matters. Your baby cannot get too much of either of the EFAs, but he can have too much fat overall if the fat is the wrong type. Avoid both trans fats and saturated fats. Trans fats -- often identified as "partially hydrogenated oils" are often found in fried foods, baked goods, margarines and shortenings; they may be found in some dairy products as well. Saturated fats come mostly from animal sources -- fatty meats, lard, and some cheeses. 1. Be sure your baby is getting protein at every single meal -- this is critical to proper growth and development! 2. If your baby can't chew on meat (lack of teeth // refuses // etc. ), simply puree it. We have been pureeing meat and fish for Olivia since 6 months with her vegetables. Just because they don't have teeth doesn't mean you shouldn't offer meat! 3. If you are intimidated by pureeing beef or chicken/turkey, start with fish. Both salmon and cod are easy to bake, easy to flake and therefore super smooth when pureed into vegetables. The majority of Olivia's protein comes from her favorite fish! 4. Adequate fat should be offered to a baby every day. Add a little bit of butter or coconut oil to their food on a regular basis. Integrate an avocado into their meals. Once they are older, nuts and nut butters are also excellent sources of fat. 5. Avoid trans and saturated fats and instead focus on omega-6 and omega-3s found naturally in food. 6. Take it one day at a time -- I've learned what Olivia likes and what works best for us through trial and error. Be patient with yourself and with your baby. Every day is a new day to try a new food or technique. By investing time into what you're feeding your baby, you are investing into their health, growth and development! If you have any questions from these four weeks of Eating Habits & Your Baby, feel free to send me an email and I'll do my best to help! Hey :) I was wondering if you could share how you incorporate coconut oil into your daughters diet. I have an almost one year old and would love to begin doing this. This was such great information! I wish there was a parenting class that incorporated all of the need-to-knows for growing a healthy, well-developed child! I doubt many parents monitor their baby's protein and fat intake.